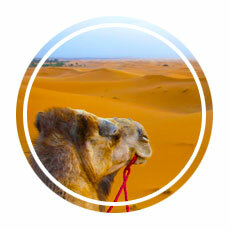 Our Moroccan adventure started in Marrakech, a city that was nothing short of electric. 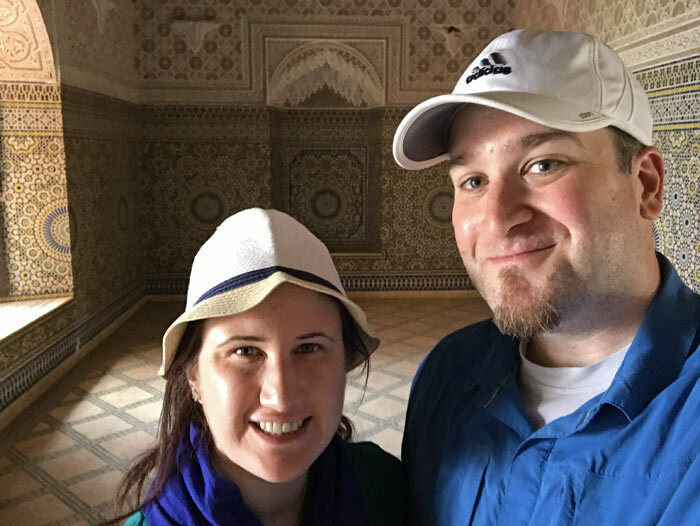 We spent our first day completely immersed—even a bit lost—in the crowds, the winding alleys, and the energy that is characteristic of many cities we have visited. 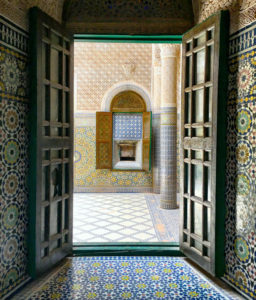 On our second day we awoke rested and ready to leave the chaos behind; the Morocco I wanted to get to know lay beyond the medina’s walls. 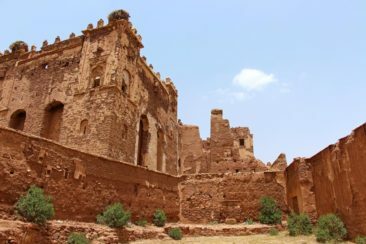 It didn’t take long before I realized a big part of Morocco would be defined through the history made in its kasbahs. 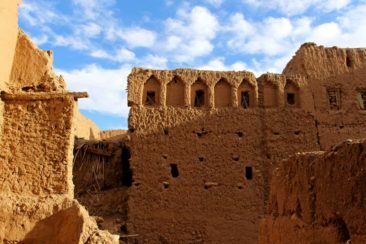 Kasbahs functioned a bit like towns—they were larger than villages but still smaller than cities—and each one represented a mixture of community, culture, religion, and wealth. Built as fortresses with red mud walls, kasbahs housed multiple family units—sometimes families who shared a bloodline and sometimes not—and they were both welcoming and tolerant of people of different faiths. Most kasbahs served as fortresses and were built at a high elevation in order to provide a good vantage point to recognize potential attacks before intruders got too close. 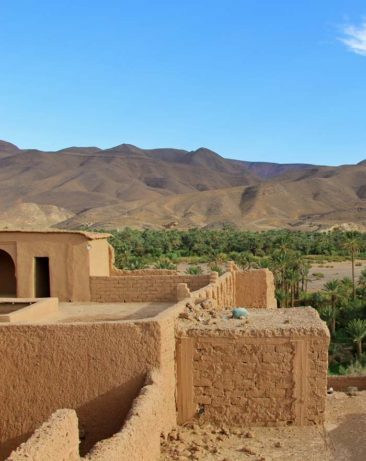 Dozens of kasbahs dot the landscape of any given point in southern Morocco; today they are converted into hotels, serve as tourist attractions, or stand abandoned as native Moroccans moved away in search for more convenient or modern housing. 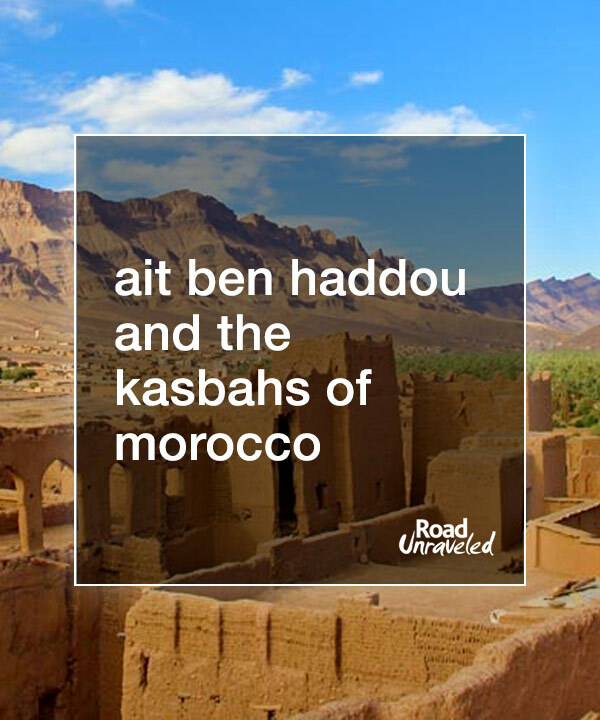 We had a chance to explore a few of Morocco’s kasbahs as we wove our way throughout the southern part of the country. Here are some fun facts and pictures about a few of our favorites. Our first close look at Morocco’s kasbahs came in Tamnougalt, an old village with a lengthy history. 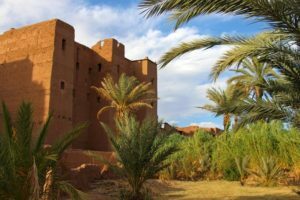 Dating at least as far back as the 1600s, Tamnougalt served an important historic role due to its position on the Spice Route to Marrakech. 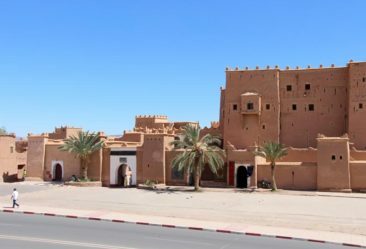 This kasbah captured our interest immediately. 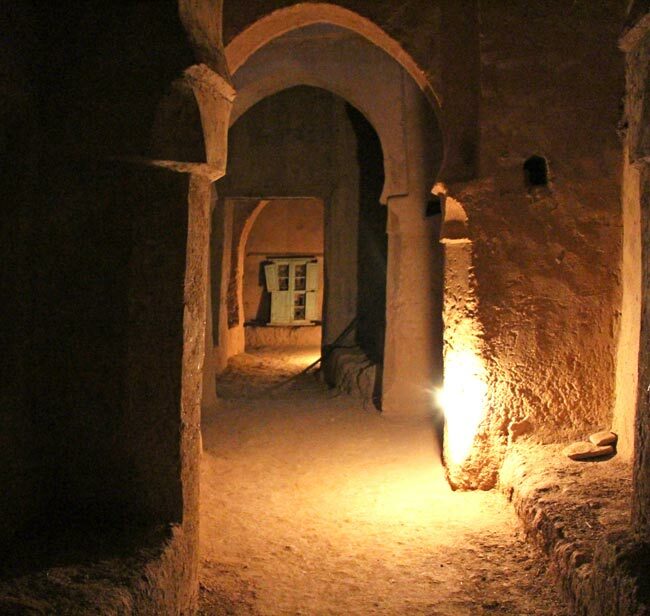 We could easily picture what it might have been like hundreds of years ago—even just a few decades ago—to walk through the dark labyrinth of hallways that connected various buildings together. 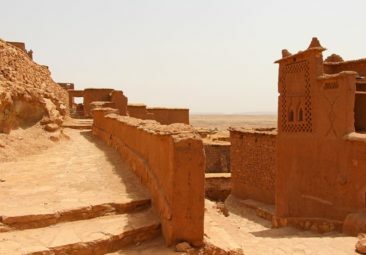 Kasbahs often housed kings or rulers, and that part of history also claimed a place in Tamnougalt. 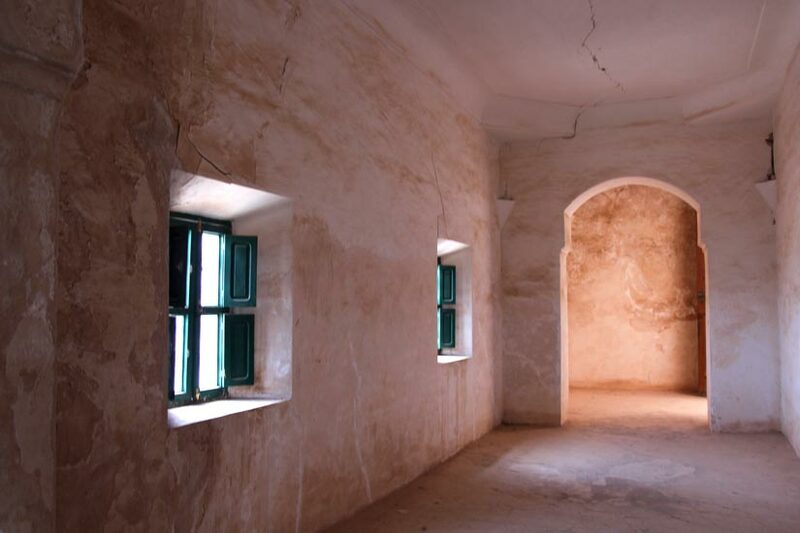 Deep within the kashbah we stood in a windowless room where rulers would once have served as judges to settle disputes between others who lived in the area. That room, like many others, opened up into a small two-story courtyard. 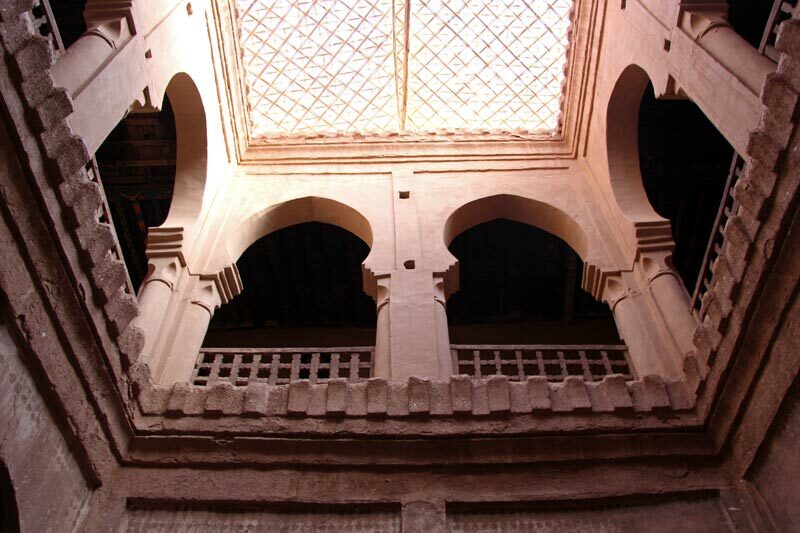 Our tour guide explained that the women who lived in the kasbah would stay on the second floor during the day, when townspeople in need of guidance or assistance from the local ruler would come in and out. 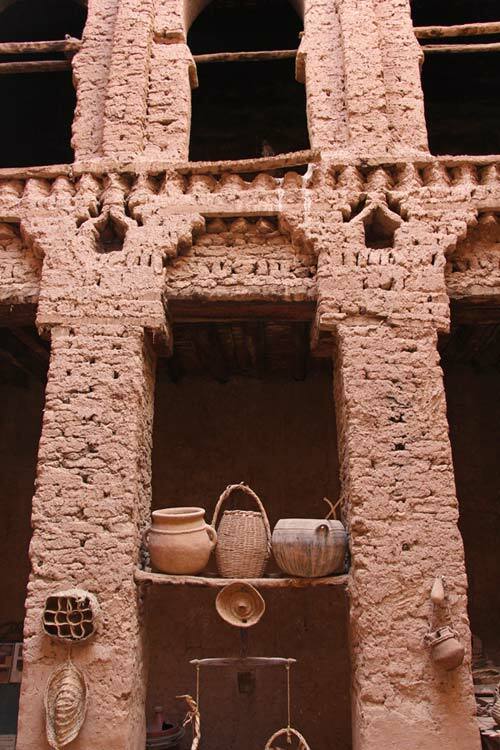 When the kasbah was less busy, the women would spend more of their time on the ground floor, where they cooked using pots that are still on display today. Perhaps the most memorable aspect of the kasbah was outside its walls. 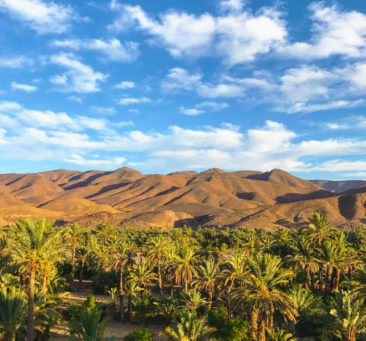 After enjoying ample time to explore the kasbah’s many rooms, we took a walk outside and found ourselves standing in the shade of hundreds of palm trees. The view was as beautiful as it was unexpected; the historic kasbah to one side and the palm trees standing against the backdrop of the High Atlas Mountains on the other side. 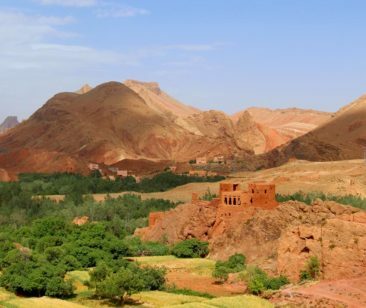 Morocco is a land of contrasts, with varied landscapes that somehow manage to house everything from rocky peaks to tropical vegetation. 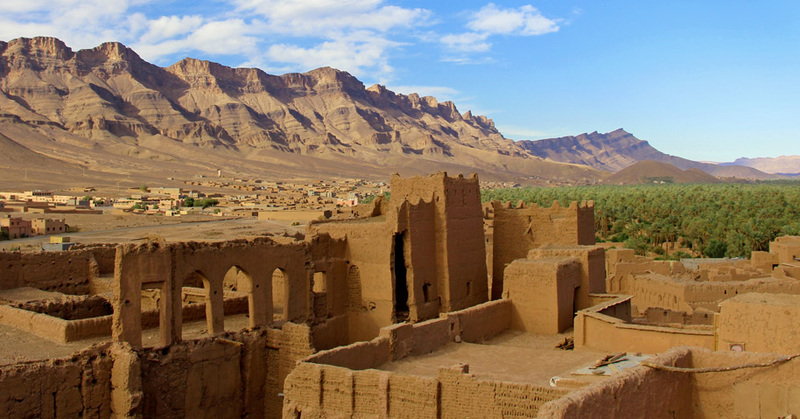 I pondered whether the kasbah’s former inhabitants appreciated the incredible view or if it’s possible to eventually take it all for granted. Regardless, I was glad to have the awareness to value it myself. 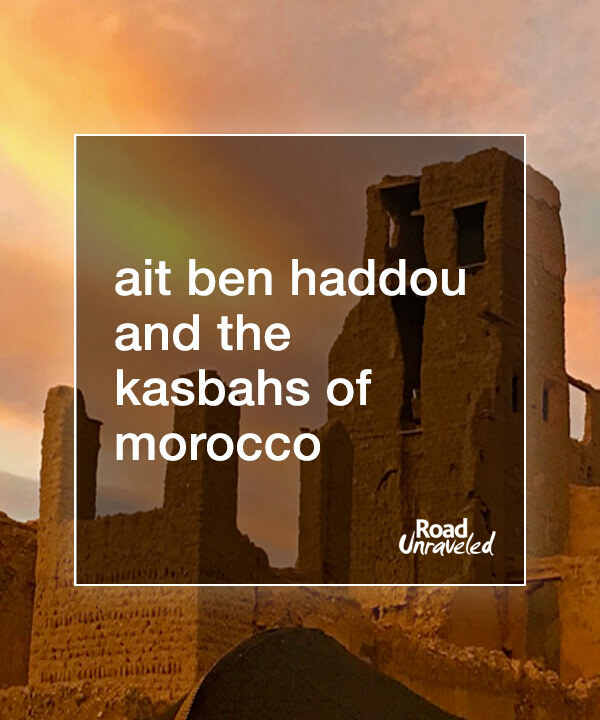 VIDEO: Amnay and friends rockin the kasbah! 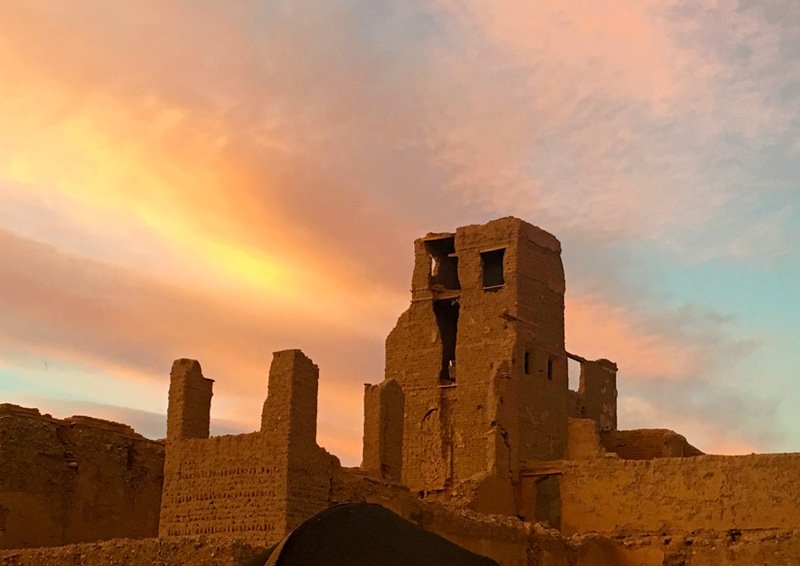 We spent a night at the kasbah in Tamnougalt, which meant we had a chance to have dinner and watch the sunset from a rooftop terrace. 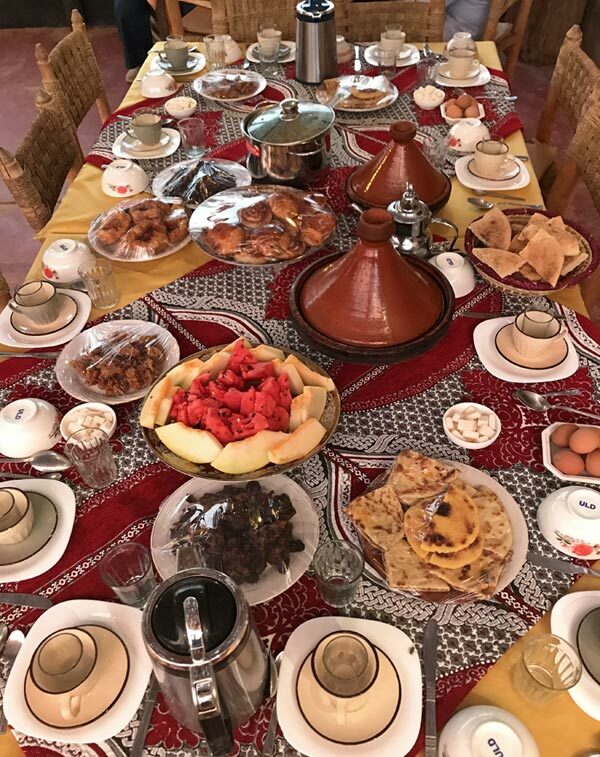 Our visit coincided with Ramadan, so dinner was a traditional Iftar meal with dates, harira soup, tagine, and fresh fruit among other treats. That was only the first course, though; the second course, couscous, was served closer to midnight. While the couscous cooked, a few people at our table found a music video featuring our tour guide (Amnay is an actual rock star who has performed around the world!). That was enough to convince Amnay to grab his guitar from the car and treat us all to a couple of acoustic songs. The fun didn’t stop there, though; before long, someone brought out some castanets and a couple of Djembes, and later a banjo was entered into the mix. What followed was an incredibly fun and moving ad hoc performance that completely encaptured us as we got lost in the music and the moment. 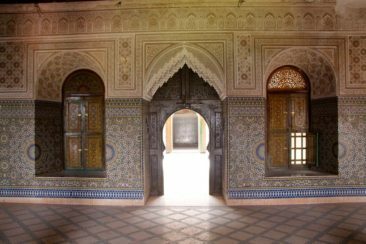 As the music swelled and the volume increased, I laughed to myself as I realized we were in Morocco, more or less rocking the kasbah. 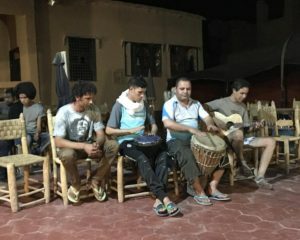 I don’t know if that’s what The Clash had in mind, but it was the perfect way to spend a warm evening in Tamnaougalt with new friends. Kasbah Telouet isn’t one of the most famous or recognizable kasbahs in Morocco, but it should be. From the outside, it’s unimpressive; parts of it seem to have fallen to disrepair, and as we wove our way from its entrance into the depths of its interior we dodged piles of rocks and rubble from the crumbling walls. Once we reached the reception rooms, though, our opinions changed quickly. 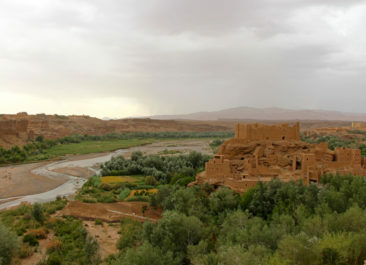 Kasbah Telouet was home to the Glaoui family. 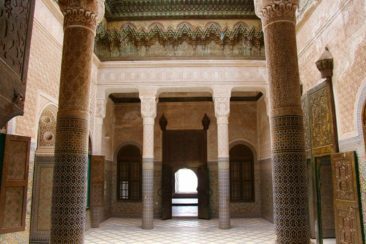 Thami El Glaoui, famed for being the “Lord of the Atlas,” was a wealthy, high-ranking leader in Morocco from early in the 20th century. 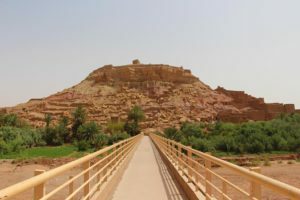 Due at least in part to his allegiance to France and France’s desire to repay him by securing his position as a leader, the Glaoui family’s fortune was estimated to reach approximately $50 million in total. 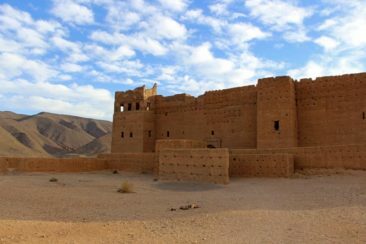 Their wealth was evident when we reached the best-preserved part of the kasbah. 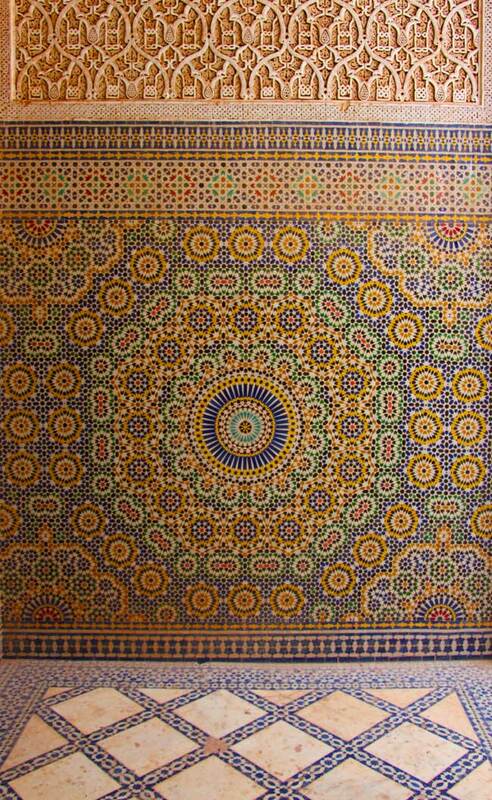 Today, Kasbah Telouet displays some of the most beautiful mosaic tile work you will find in Morocco. 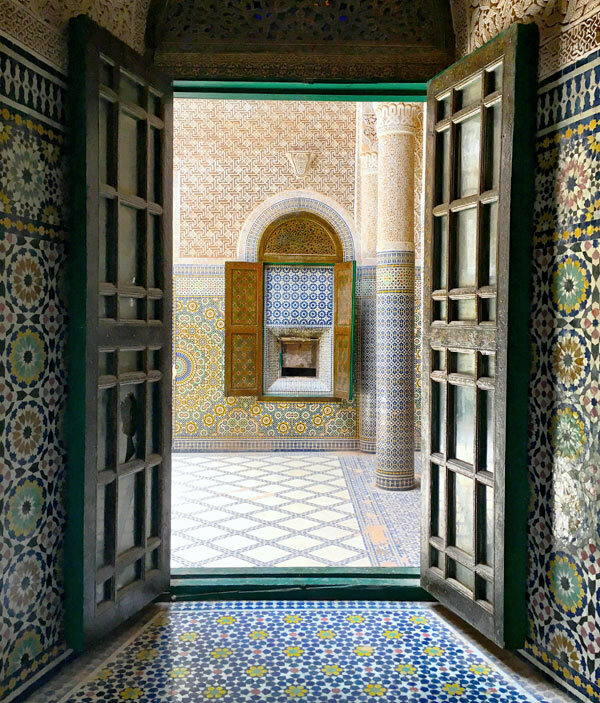 From floor to ceiling, from the tall columns supporting the building’s structure to the tops of the arched doorways and windows, the rooms are adorned with thousands of colorful squares carefully and artfully arranged into gorgeous patterns. As many as three hundred workers were involved in the creation of the rooms, but far fewer numbers filled them on the day we visited. 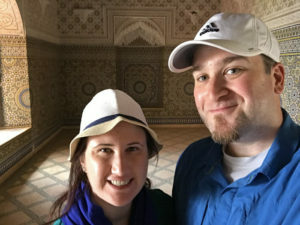 There were just four travelers on the tour, which left us with plenty of space to wander, take pictures, and simply admire the colors and designs. 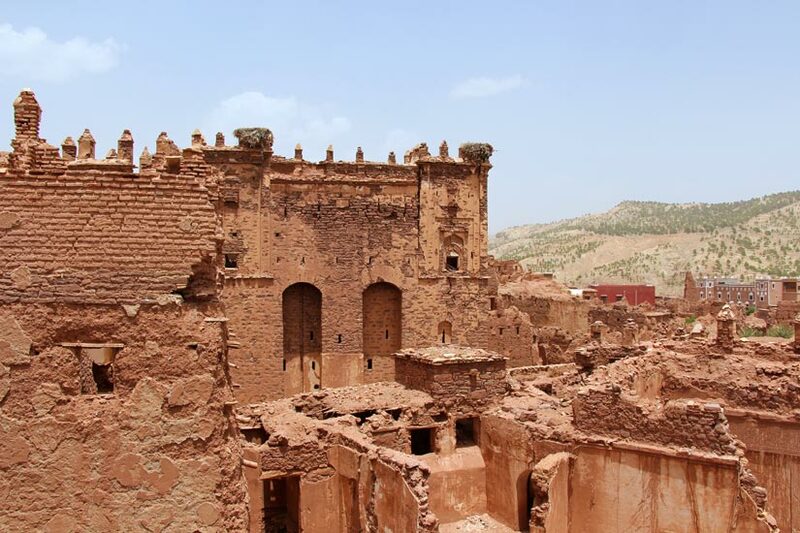 That’s what made Kasbah Telouet such a hidden gem for us. 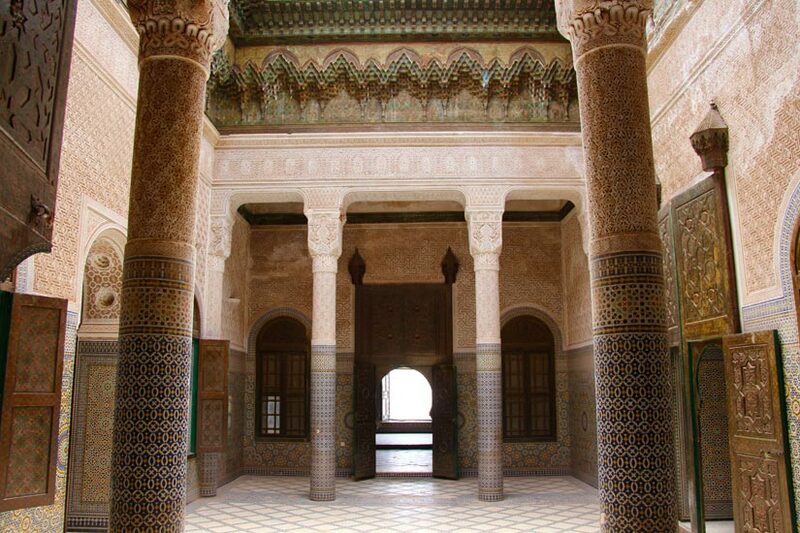 It’s rare to find a place that is beautiful, historic, and still somehow off the beaten tourist path. 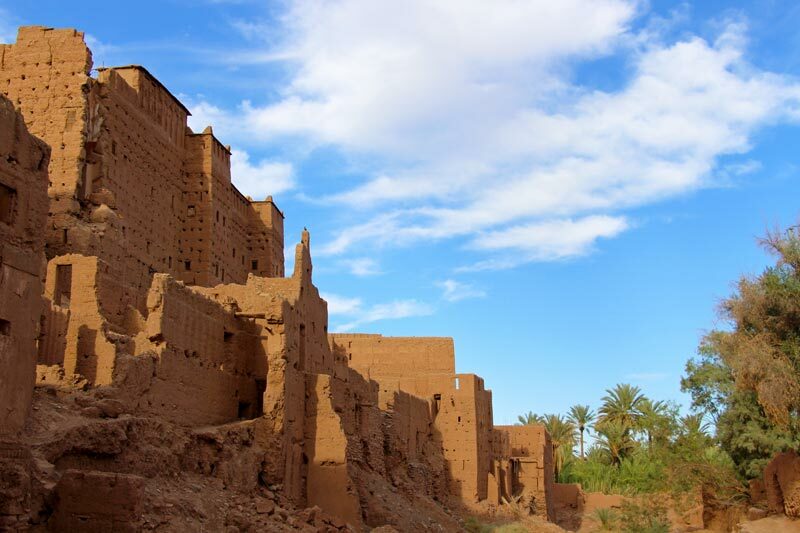 Having the opportunity to enjoy the kasbah without the crowds we have come to expect was a refreshing surprise. 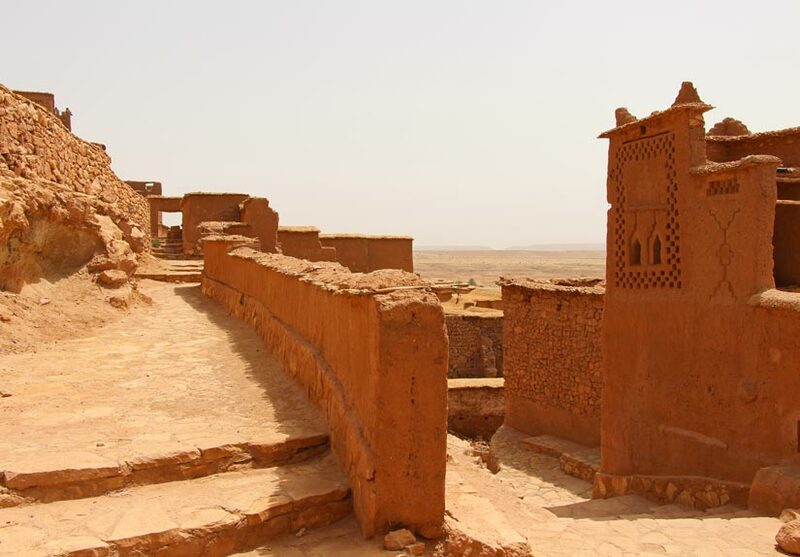 Chances are, if you have heard of any of Morocco’s kasbahs, you have heard of the UNESCO World Heritage site Ksar Ait Ben Haddou. 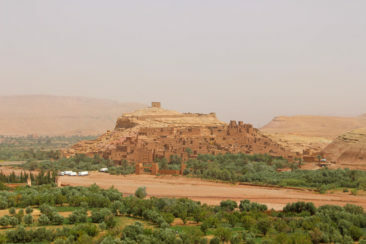 If you haven’t heard of it, there’s still a good chance you have seen it: Ait Ben Haddou starred in numerous movies over the last few decades, including Gladiator, Kingdom of Heaven, Game of Thrones, Lawrence of Arabia, Babel, Alexander, Kundun, The Last Temptation of Christ, The Mummy (1999), Body of Lies, and The Man Who Knew Too Much. 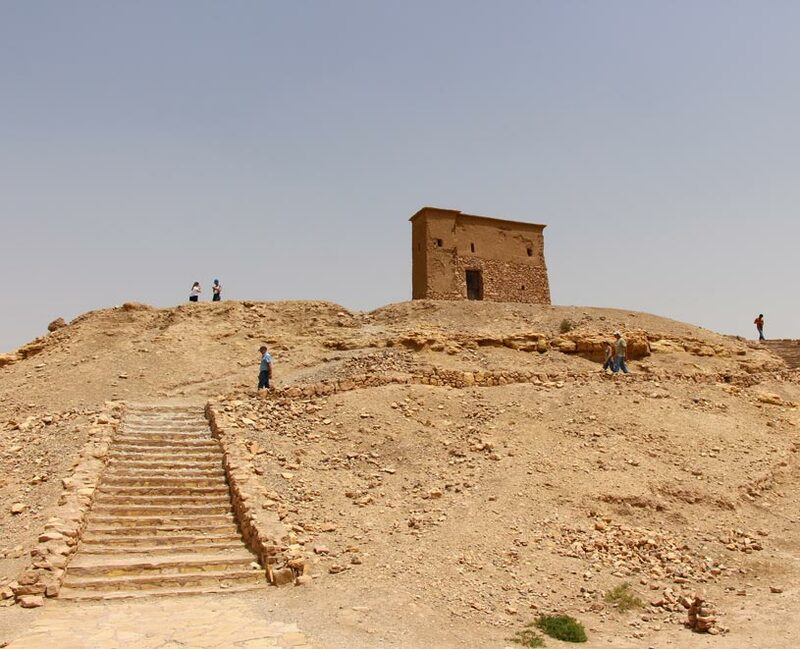 The site dates to around the 17th century and the location was a popular trading post along the ancient north African trade routes. 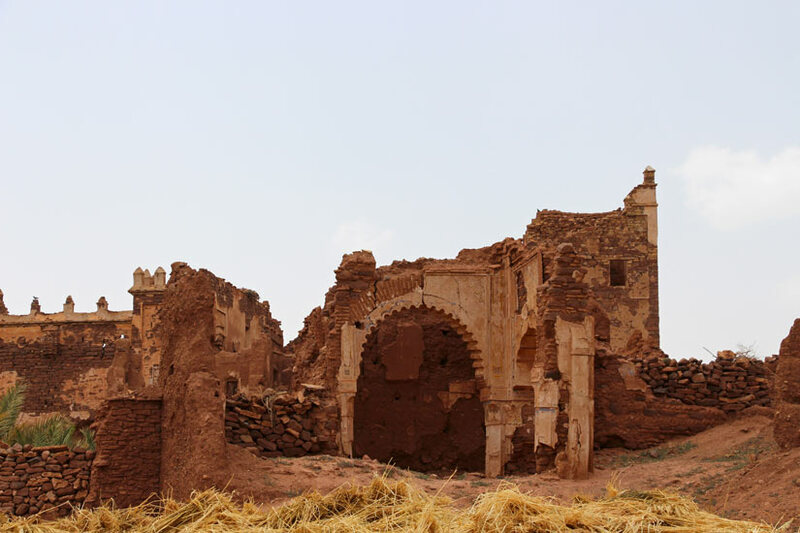 Unlike many of the kasbahs we saw, this one wasn’t quiet, abandoned, or left to crumble under the weight of its own history. 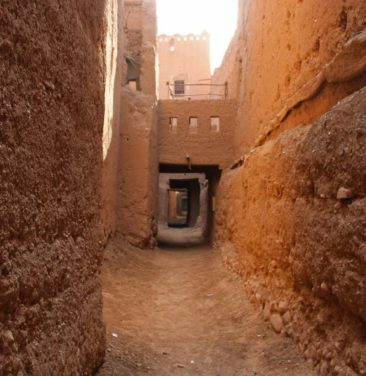 As we climbed up the many steps toward the highest point of the kasbah, we passed dozens of shops, artists, and fellow travelers. We watched as a movie crew set up lighting and umbrellas in the green valley below. 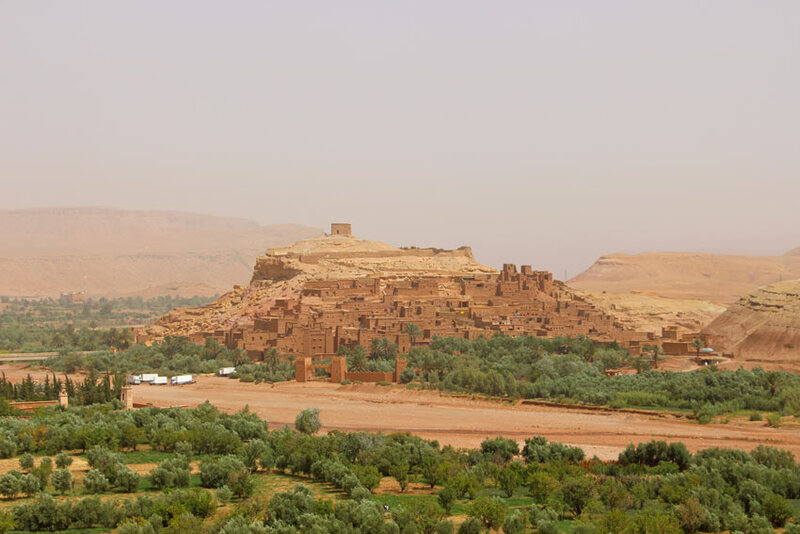 Ait Ben Haddou is, without question, thriving. 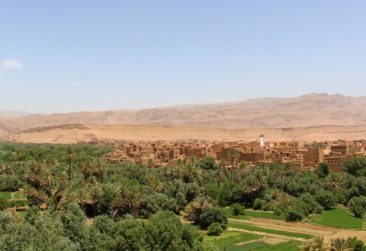 Our singular goal was to climb to the very top of the kasbah to see the sweeping views below us, but we made a few stops along the way. 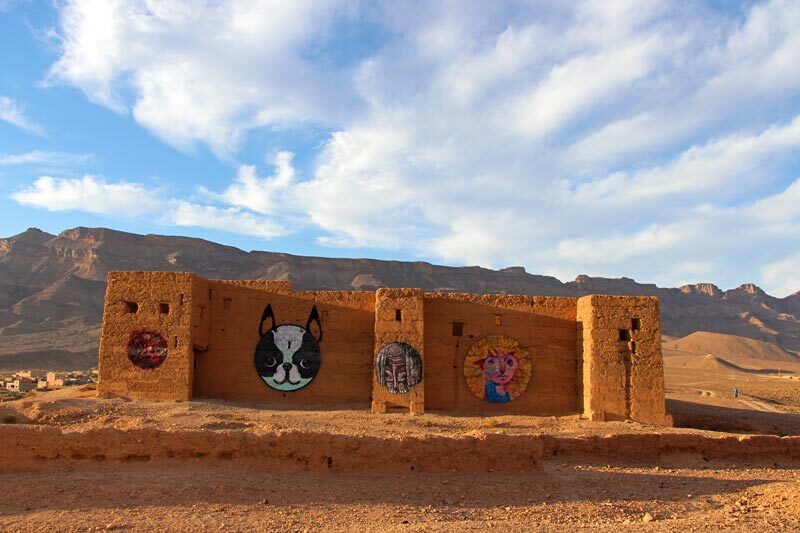 My favorite was to see a local artist who demonstrated a watercolor technique that is unique to Morocco. 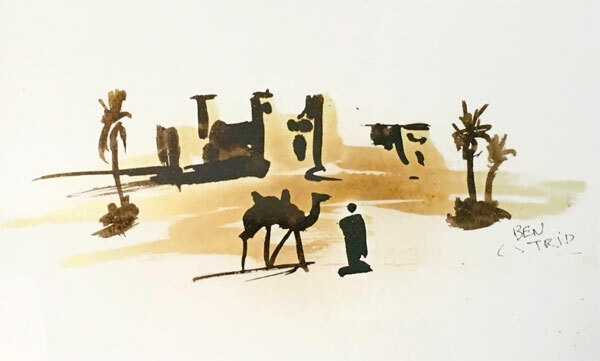 On a blank piece of paper he painted with a mixture of water, saffron, tea, and indigo. When it was finished, he held the paper up to a flame and we watched in awe as the painting came to life. Each of the colors and layers he painted added dimension to his artwork, and before long what had been pale yellow and gray blobs took the shape of camels standing next to a kasbah. The entire piece took mere minutes to create, and I offered to buy the painting I watched him create on the spot. The artist seemed perplexed by this; usually, after demonstrating the technique to tourists, he would finish the paintings by adding shadowing and coloring in the sky. I don’t think he often sold unfinished works when there were so many finished pieces to choose from, but I wanted to bring the artwork I watched him create home with me. I ended up getting a great deal—about $4 USD!—on a painting I will display in my home for a long time. 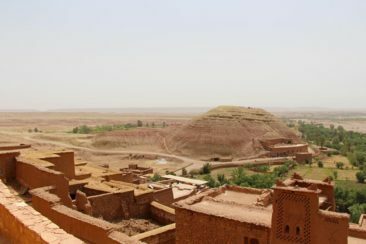 By the time we made it to the top of the kasbah, we were rewarded with an incredible look at the landscape around Ait Ben Haddou. 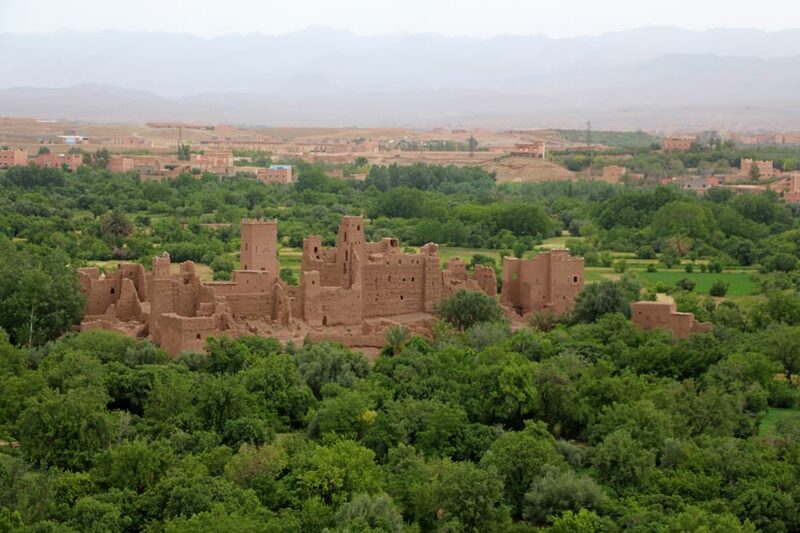 It’s also easy to see just how large and impressive the kasbah is from that vantage point. Where many families once lived there, today most of them have left for more modern homes on the other side of the river. 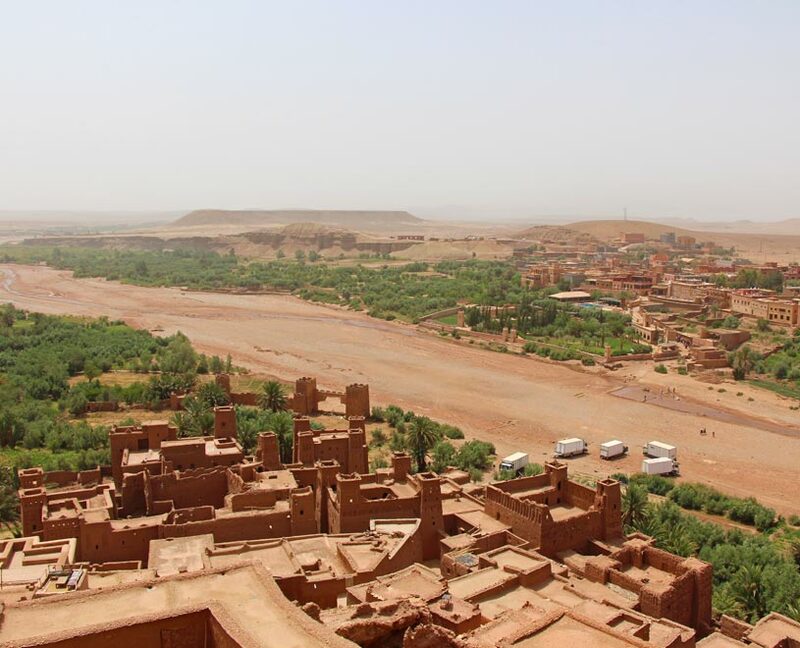 There are still just a few families who live there today, despite the fact Ait Ben Haddou doesn’t have running water or electricity. For some people, a more traditional, simpler way of life is just fine. Honestly, for the chance to call such an impressive and historic place home, I can understand why someone might give up a few modern conveniences. 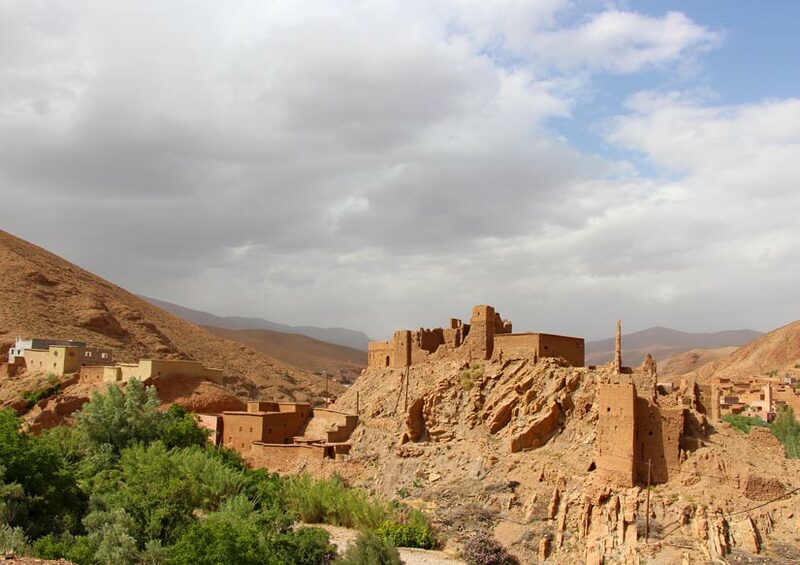 Morocco is sometimes called the Land of 1,000 Kasbahs, and we visited just a sampling of them. 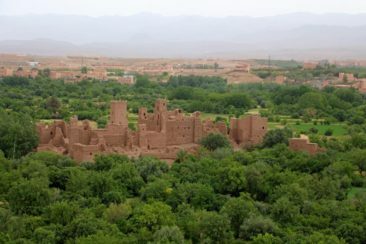 While many share similar characteristics, each kasbah has its own rich history and unique features. 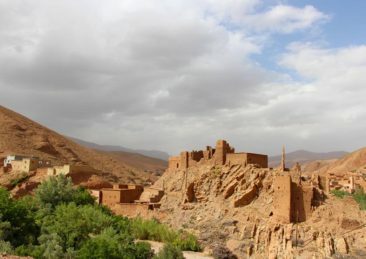 Whether they were well cared for like in Tamnougalt, full of hidden surprises like Telouet, or famous like Aït Benhaddou, I found myself smiling each time we passed one during our tour of Morocco. 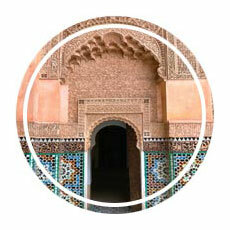 The kasbahs provided us with an incredible look into Morocco’s life, history, and culture! 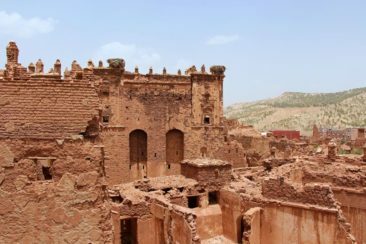 If Morocco is the Land of 1,000 Kasbahs and a picture speaks 1,000 words, we hope this gallery shares just how overwhelmingly beautiful we found each kasbah to be! Planning a trip to Morocco? 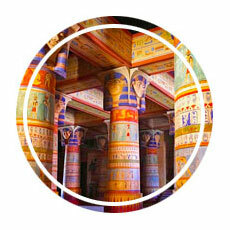 Here are a few more posts to inspire your travel throughout the country!